The Venue Manager screen is not available until you go to Event Espresso > General Settings > Advanced Features and change the Use the Venue Manager? dropdown to yes and save. If your events run at venues and locations other than your company address, you can easily set up and manage venues via the Venue Manager menu. This allows you to add any number of venues, which can then be added into individual events. 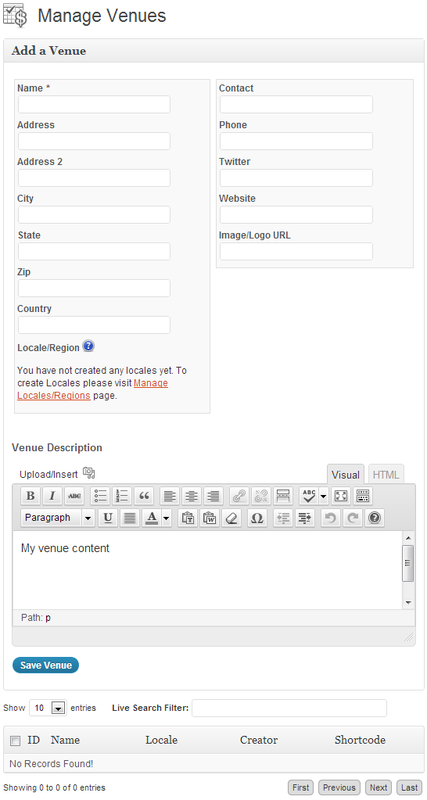 The first thing you will see is the Manage Venues overview page where you can add or edit venues. To add a venue, click one of the Add New Venue buttons at the top or bottom of the screen. Locale: If you have the Roles and Permissions Pro add on, you can group your venues together in locales. After creating a locale (see the Locales/Regions documentation) you simply select the correct one from the dropdown box. Contact: Add the details of the contact person for the event. Venue Description: Add a description of the venue, this will be displayed when you use the Venue shortcodes. Once you have some venues the Manage Venues overview page will be populated and you can see at a glance the Venues ID, Name, Locale, Creator and Shortcode. The shortcode can be used in any post, page or event. The Live Search Filter can be used to quickly find venues by name, locale, creator etc.